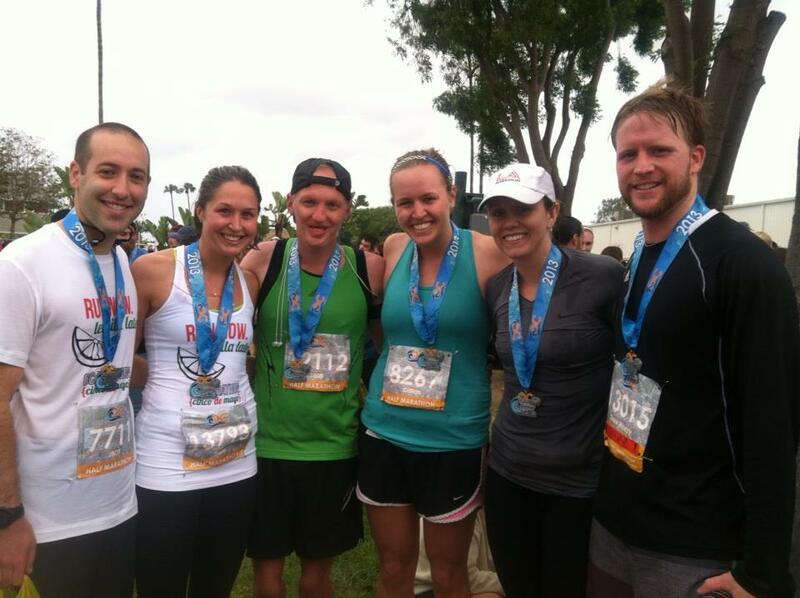 the oc half. [race recap]. This is one of my favorite races I’ve done. A bunch of different factors converged to make Sunday a great race. My best friend Whitney had signed up too – and this was her very first 13.1, so it made this weekend that much more exciting. We drove down on Saturday morning and quickly went to the Expo. While I loved this race, I did not love the expo. It was pretty crowded, we didn’t get goody bags of any kind, and the shirts were okay. The standard number of vendors were there, but it just wasn’t awesome. Surf City had a much more fun expo. 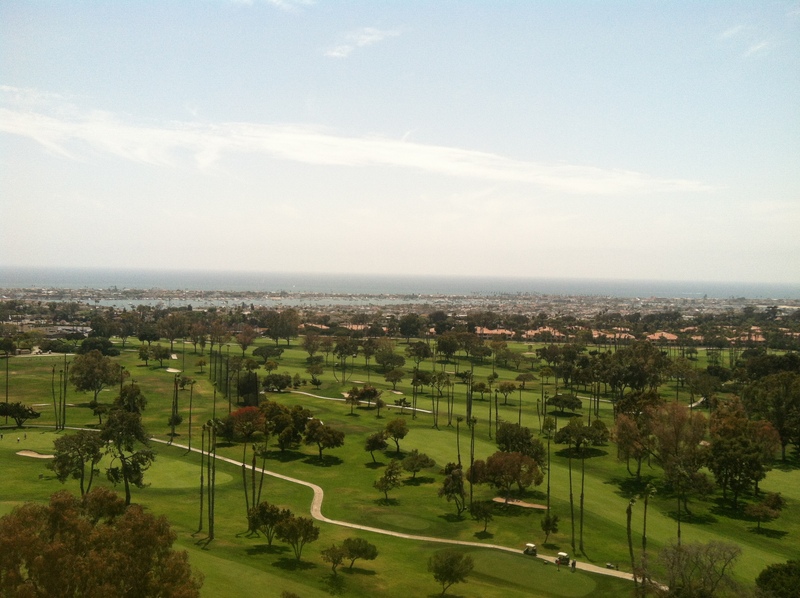 We checked in at the Newport Beach Marriott which I loved. 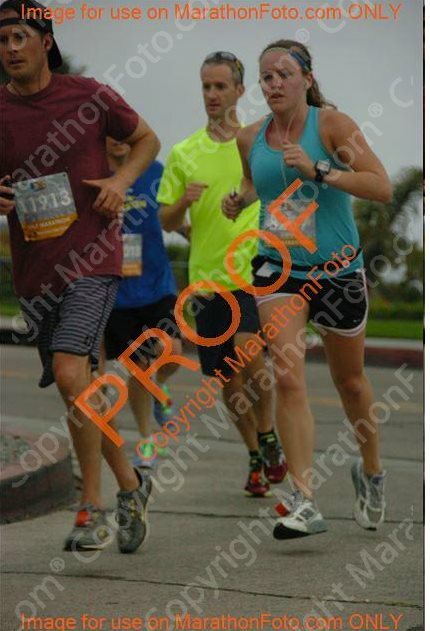 We were directly in front of the start line and it just made everything about the weekend easy. The fact that they accidentally booked us in a room on the 15th floor with a panoramic view of the ocean didn’t hurt either. Pro Tip: save the hassle (and money) of parking at the hotel by parking for free across the street at Fashion Island. We set our alarms for 4:50 for a 6:15 gun time. I had my usual pre-race instant coffee (Starbucks’ VIA packets really aren’t terrible) and 2/3 of a Clif Bar. We met up with some of Whitney’s colleagues in the lobby and our friend Hannes from HS got dropped off by a cab. Around 6 am we walked across the street for the start. 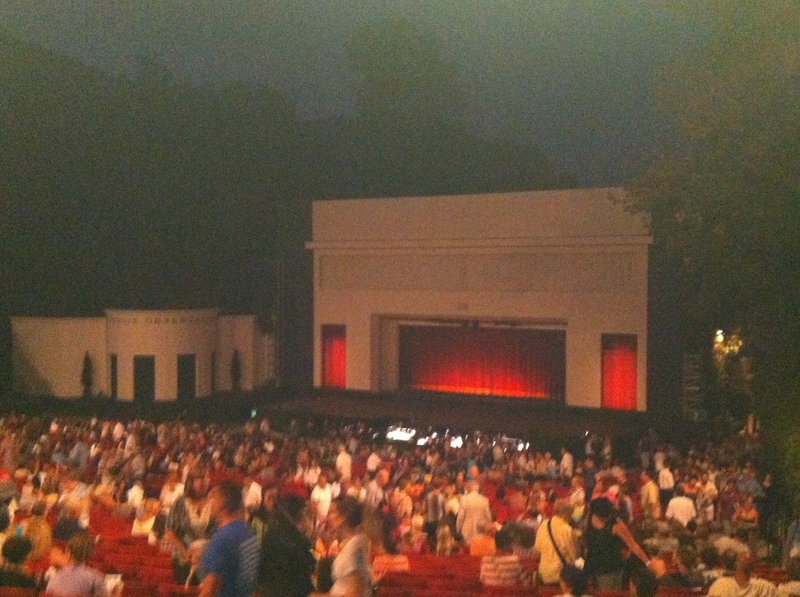 Hannes and I were in Corral 1. On our way there, we saw our former cross country coach, Christina Lightfoot, who crushed the half in a time of 1:29. The race start was pretty seamless. The race director made some mildly offensive disparaging comment about LA, but redeemed himself by offering a moment of silence for the victims of the Boston Marathon. The horn sounded and we were off. I immediately had a lot of problems with my SPI-belt. It wouldn’t sit right and my iPhone was in it, and it kept flapping and bugging me. The first 3 miles were pretty much filled with me thinking about how annoyed I was and trying to fix it. The first mile had a little bit of a hill, and then major downhill to get to PCH. The weather and views of the homes and the water were really gorgeous. Finally around mile 3 I took my iPhone out of the belt and held it. Also in mile 3 or 4, a friend from Loyola, Danielle, caught up to me. We ended up running probably 4-5 miles together, and chatted. It was a great way to pass the time, and since she is from Newport she knew when the hills were coming up. 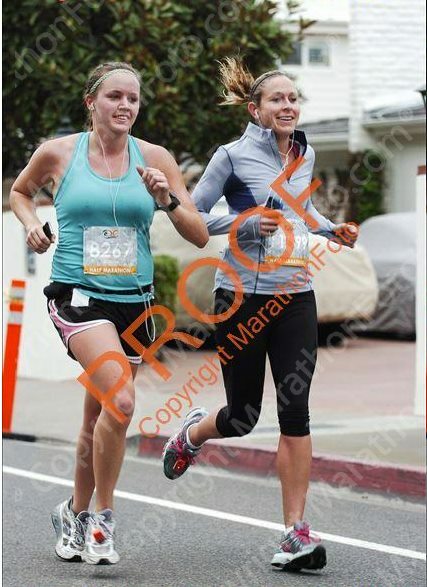 I ended up pulling away from her a little, but she finished just a few seconds behind me. 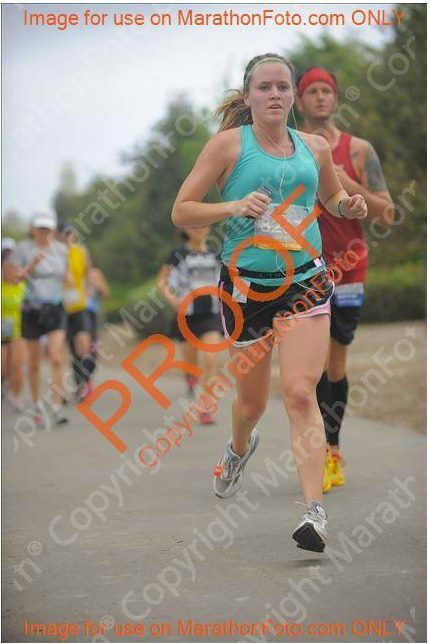 My race photos are somewhat of a monstrosity. My pronation has never looked worse. I took 3 shot blocks around 40 min and a gel when I passed the gel station (mile 9?). I normally only fuel once but I think having something twice helped me. Whitney’s cheering section were at miles 7 and 11, but unfortunately I didn’t get to see them. The beautiful views though and relatively mild terrain made the miles go by pretty fast. I wasn’t really focused on my time – I wanted to try and keep all of my miles under 8 minutes, and to maintain a relatively even pace. I knew trying to beat my PR of 1:38:55 would be a long shot, so I just tried to maintain a relatively steady pace. One of my law school best friends, Blake, was volunteering with the race, and had told me he was stationed between miles 11 and 16 of the full marathon. 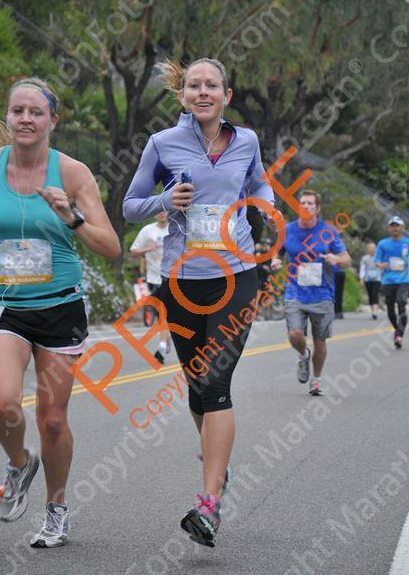 The half/full split was at mile 12. He said he’d be at Mile 12 unless he had to go pick someone up or attend to something in a different part of the course. As I turned the corner to see the split, Blake was standing in the street directing traffic. It was AWESOME seeing a familiar face that late in the race. 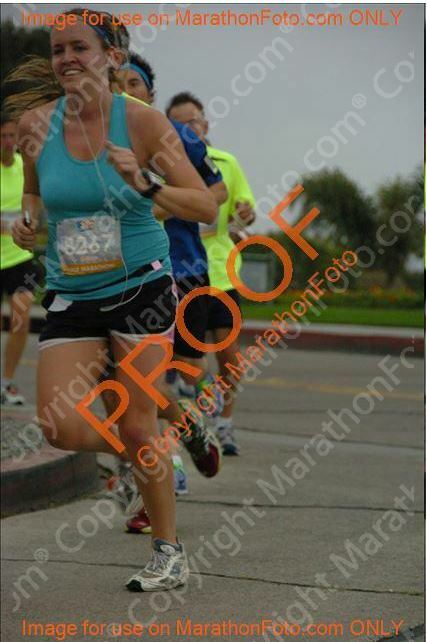 I darted to the side to grab a high-five, and headed to the last mile much more energized. During that last mile, I realized I was pretty close to my PR…but not close enough. I finished in a time of 1:39:56 (7:38 pace). After the race, I met up with Hannes (1:33 – which was a “bad day” for him…joke), and we cheered on our friends as they came through the finish. 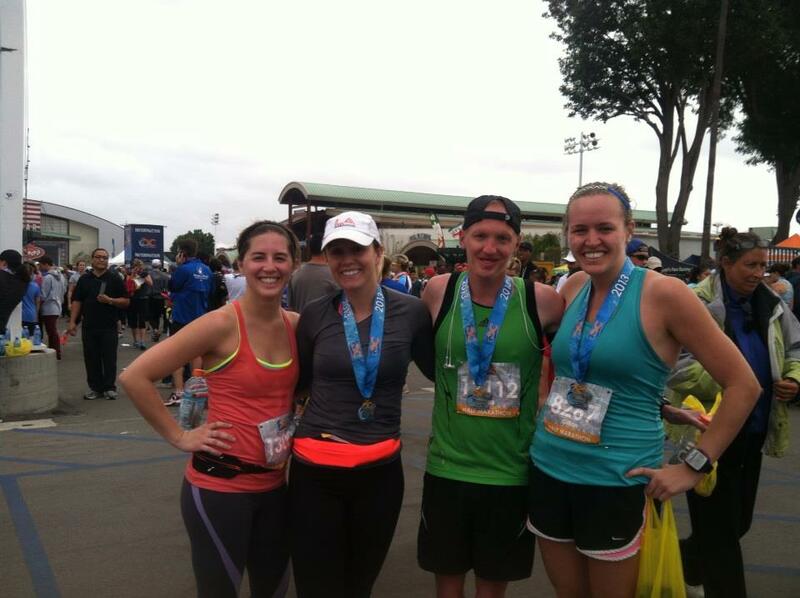 Also running on Sunday was our high school friends Sam and Kelsey, as well as Kelsey’s fiancé, Drew. I was so happy for Whitney when she crossed the line – mostly because she wasn’t in pain, had fun, and wants to do another one! Whitney, Kelsey, Hannes, and me. Overall, this is one of my favorite races I’ve done to date. Great course and so awesome to share it with so many long-time friends. I am now contemplating doing a full marathon ASAP. 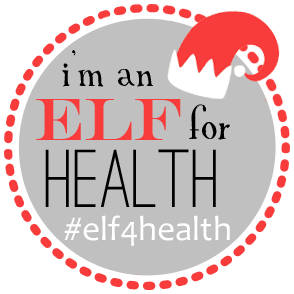 My goal is to do a long run this weekend and gauge whether or not a June marathon is a possibility. Stay tuned. Anyone else race this weekend? This was an amazing weekend. 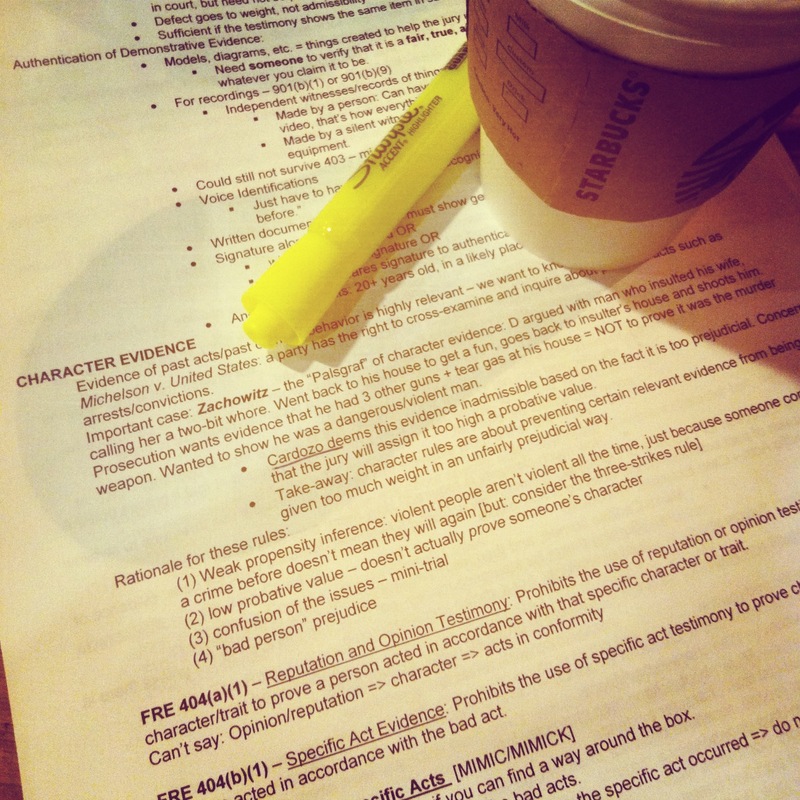 As you probably know from my Instagram or Twitter…I spent a lot of last week studying for my Evidence final. Buttt since it’s not until May 13, I could afford to take this weekend off from studying completely. 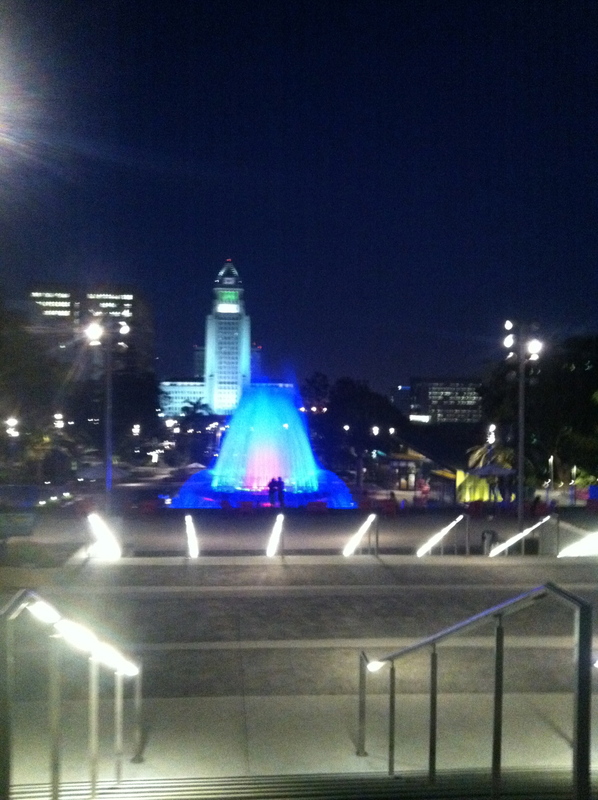 On Thursday night, I joined my running group for a 7 miler downtown. It was pretty hilly, but also gorgeous. piece of BCN in DTLA. 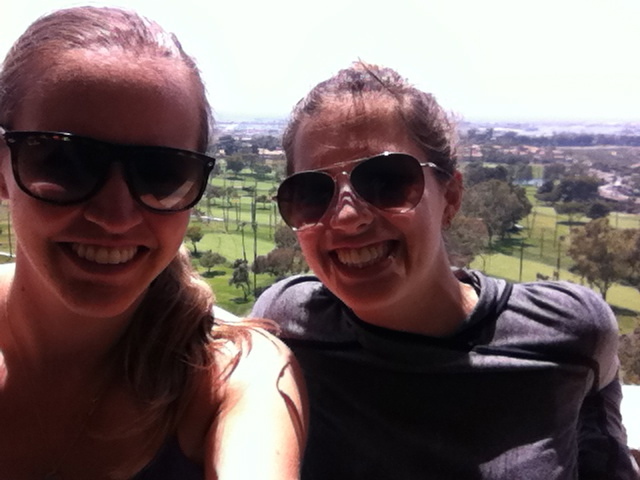 On Friday, my college friend/sorority “sister”/study abroader/fellow crazy person Michelle was in town from SF. We met up for a fun afternoon in Santa Monica. I finally put a Lululemon gift card to good use and walked out with something I never would have considered buying in the past…a running skirt! 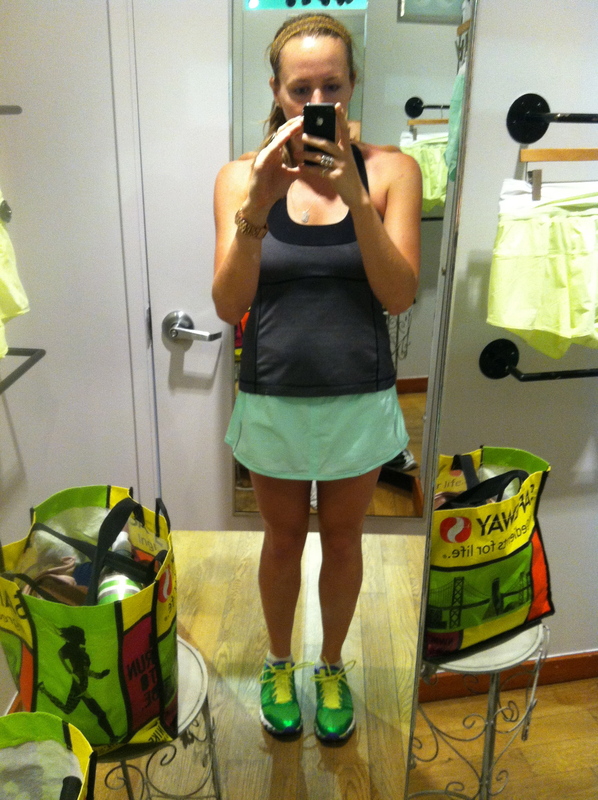 Just call me SR.
Michelle and I took a class at Soul Cycle from my fav instructor – Laura Crago. Michelle had never taken a class at Soul Cycle before and naturally fell in love. She’s counting down until their SF location opens. We showered and then grabbed a bite to eat at Barney’s Beanery. It was so great to catch up! 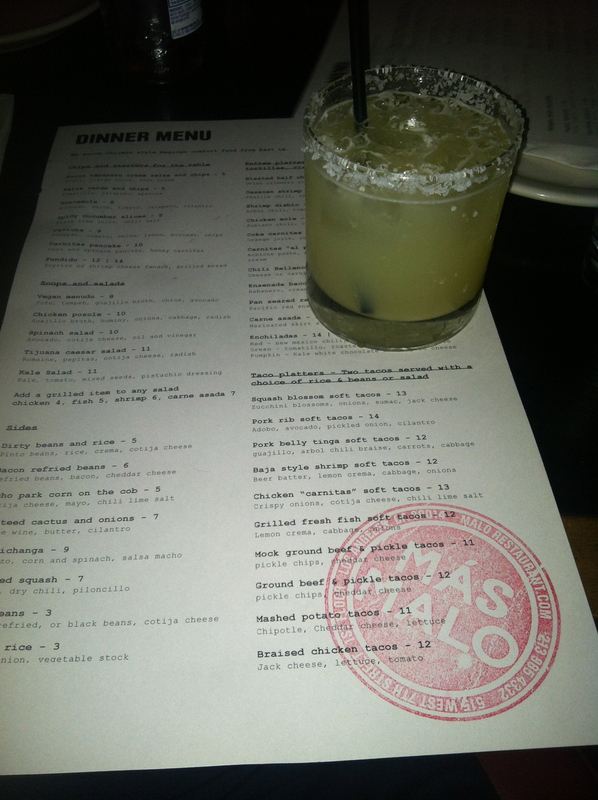 Later that evening, I grabbed drinks with my parents at Más Malo before they headed home. The recent southern CA fires are near our hometown, so they wanted to wait out traffic. After I said bye to my parents, I headed out to the valley to meet up with Whitney and our good friend from HS, Hayley, for a drink at the Blue Dog Tavern. 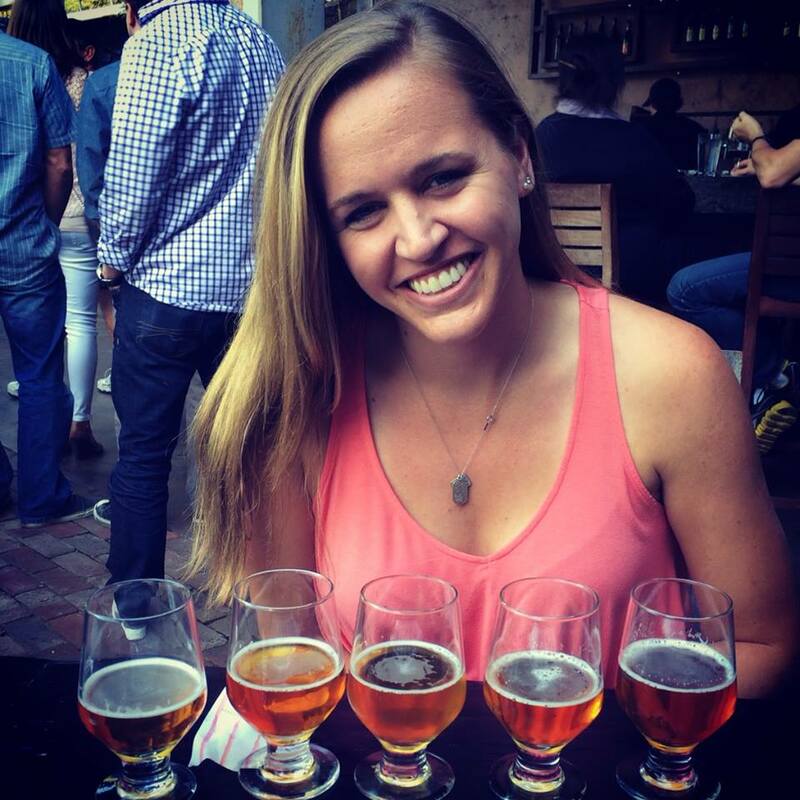 I enjoyed an IPA (duh). Hayley lives and works in Fresno, so we don’t get to see her all that often, but she is always so fun to be around when we do get to see her. 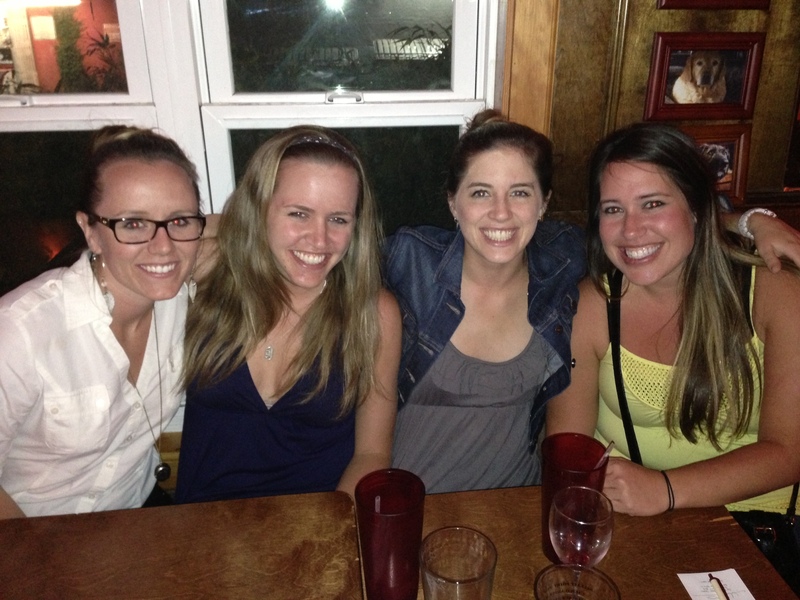 We were all chatting about how our other friend, Kelsey, had just gotten engaged on Tuesday (!!). And what do you know . . . in walks Kelsey with her fiancé, Drew. Kelsey had seen Hayley’s “check-in” on Facebook, and stopped by to surprise us. It was so nice to see her and Drew and to get the first person account of the proposal. Put that story in the “i love social media” column. kelsey, me, whitney, and hayley. just realized i’m the odd one out without an “ey” last name. 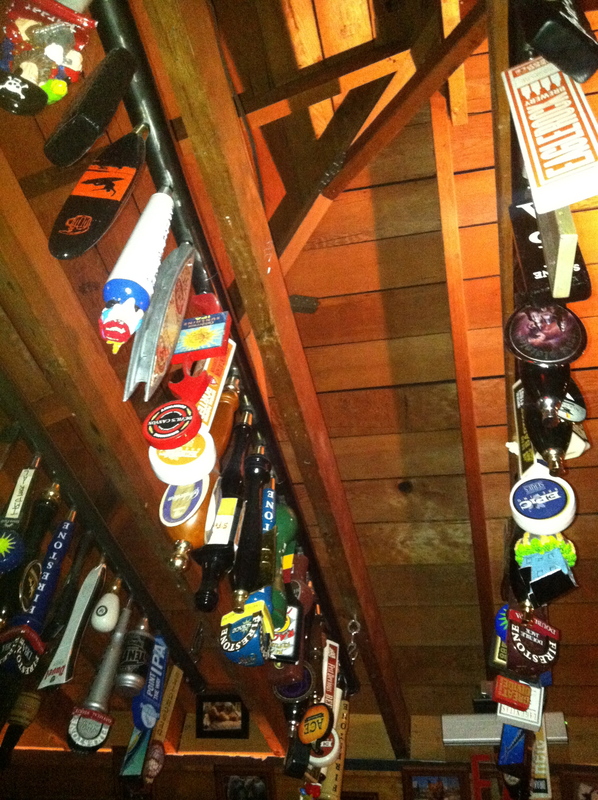 taps on taps on taps. On Saturday morning, Whitney and I left our respective apartments and met up in Costa Mesa for packet pick up for the OC Half Marathon. I will do a full re-cap of the race, but the trip itself was a lot of fun. 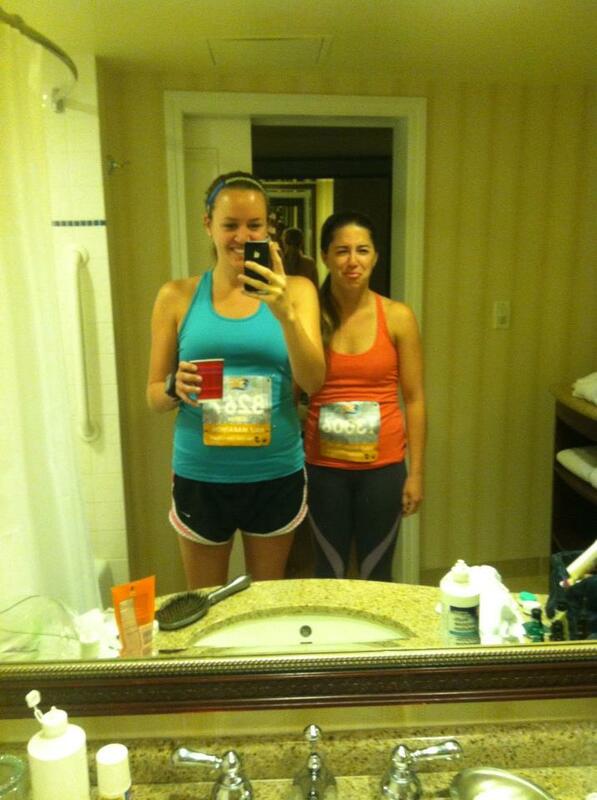 After packet pick-up, we checked in at the Marriott Newport Beach. Whitney had fallen into this room – someone she knew who was running it had booked a room, but after a pulled hamstring forced him to bow out of the race, he offered his room up to her before surrendering it back to the hotel. Well, it turns out we had inherited the “romance package”…meaning champagne for the room…which was on the 15th floor and had a panoramic view of the ocean. We spent some time lounging in the room. The view was so incredible I felt guilty if I took my eyes off of it for more than 0.4 seconds. We met up with Whitney’s family and walked around Fashion Island, and did a little shopping. I met up with another friend from high school, Sam, for a coffee. It was so great catching up with her as well. We did dinner with Whitney’s family + our friend Riley at Irvine Spectrum’s Wood Ranch (because #paleochallenge). 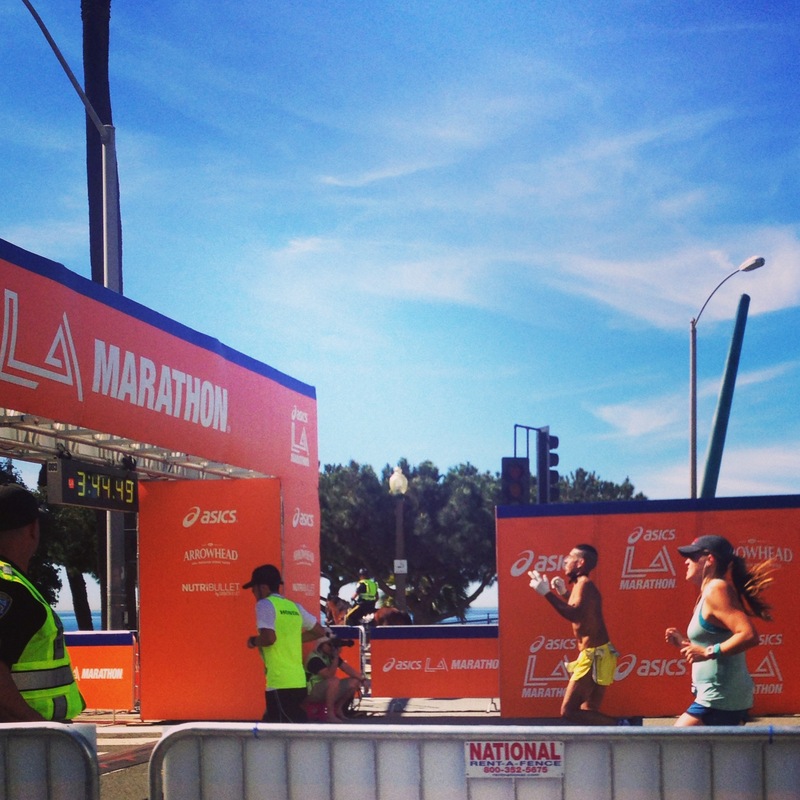 The race itself was great – and after we celebrated with a little Cinco Day Drinko action. Overall, this was a fantastic weekend. 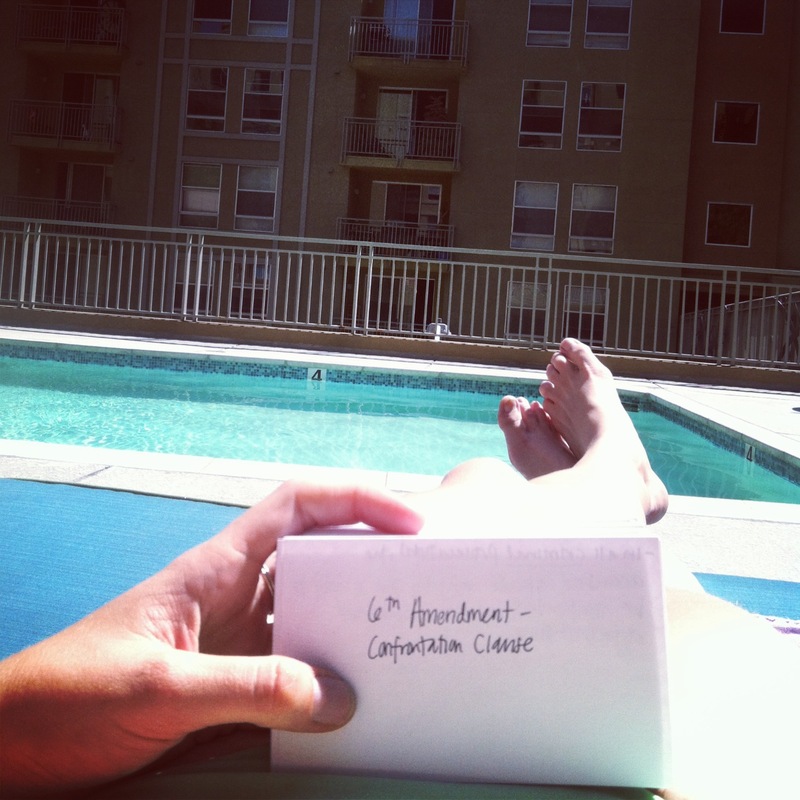 I was so lucky to blend so many different groups of friends throughout the weekend – law school, high school, college. I’ll be back soon with a full race recap. So I go back to school in precisely one week. In order to celebrate the end of summer, my mom and I decided to spend two nights away. We wrestled with where to go – our requirements were being near a body of water, ability to do some sort of fun exercise, and somewhere sunny. We landed on Newport Beach. 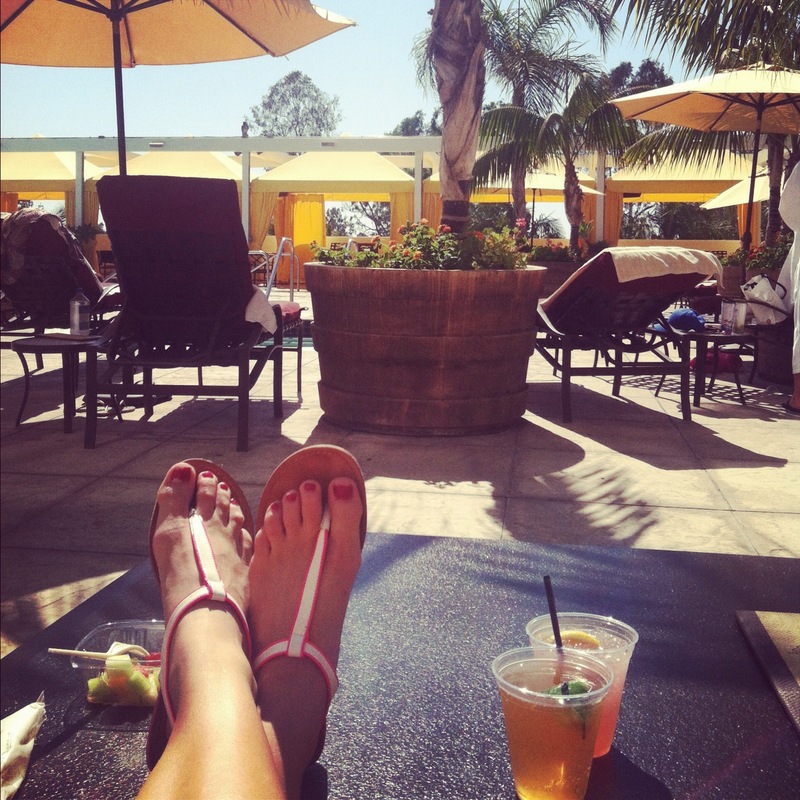 I’ve spent a tiny amount of time in Orange County over the years but have never really felt like I “know” it, so we planned a fun itinerary and drove on Saturday afternoon out to the Fairmont Newport. You can read my not so lovey-dovey Yelp review, but basically this place was super nice looking, and all of the facilities were top-notch, but the service ranged from really bad to lackluster at best. I think it is really annoying that we had to pay for parking, and that the parking was valet-only. Valet parking is nice in theory, but when you can see your car in the parking lot and can’t go get it yourself, it is super obnoxious. We made the less than stellar hotel work, though. When we checked in, we were told our room wasn’t ready, so we hit the 3rd floor deck pool area for some lounging and booze. 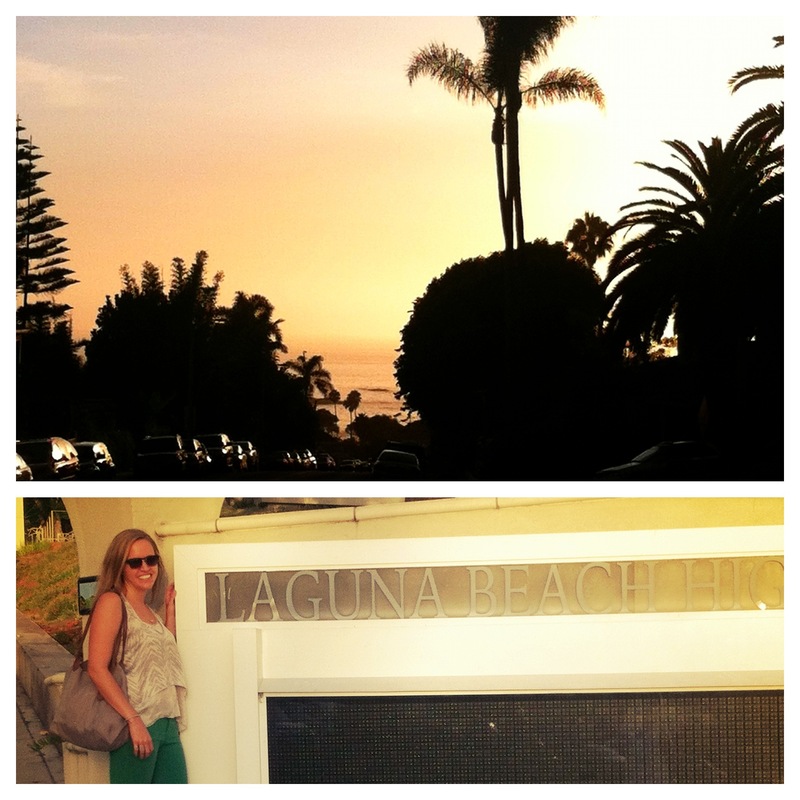 Once we were finally able to get to our room, we got ready and headed back out to Laguna Beach. I have been a little bit obsessed with Laguna Beach since the MTV show by the same name made a name for the coastal community going on 10 years ago. I was always team LC…and let’s just say, some obsessions die hard. so the LC obsession is still a thing. 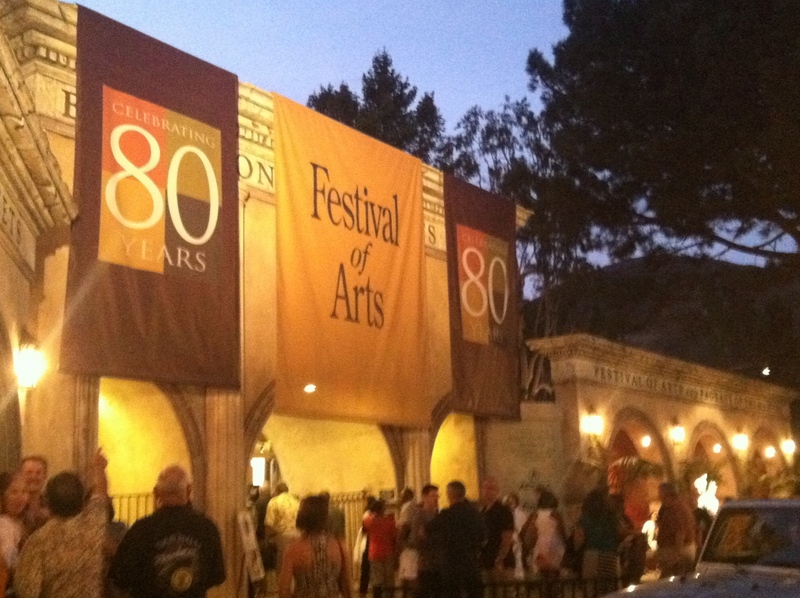 We were in Laguna to see the Pageant of the Masters – a live “tableau viviant.” We struggled to find parking big-time, but ended parking at the high school (hence this photo). 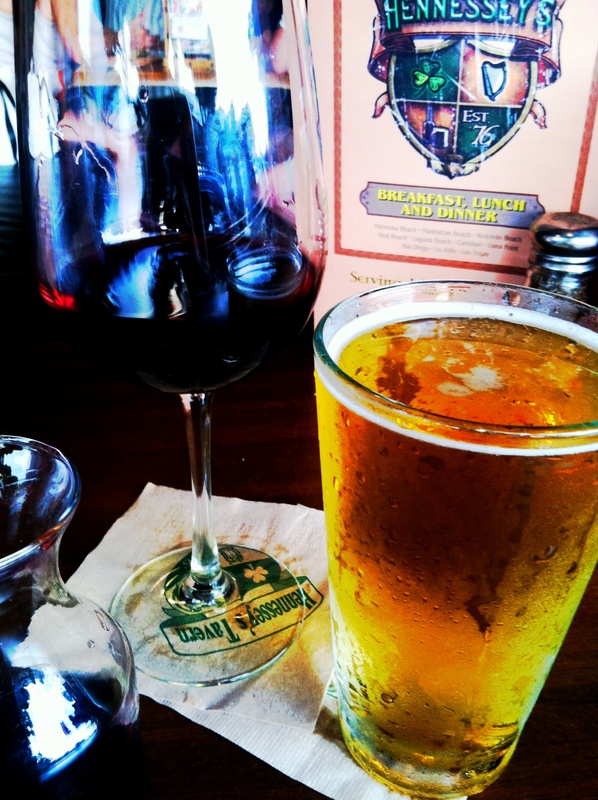 We hustled to find a quick dinner and ended up at Hennessey’s – a local bar with decent bar fare. I had a beer and enjoyed a burger topped with BBQ sauce and an onion ring. Not exactly award winning, but delicious. When we got to the Pageant, I wasn’t sure what to expect. I have heard about this for years, and my interest was re-invigorated when I read that SR was there last week. It sounded dorky at first but ended up being awesome. The whole show was narrated and there was a live orchestra which kept it interesting since it wasn’t like there were actors or singers. My favorite piece was Velazquez’ “Las Meninas” – a painting I fell in love with in Madrid, and fell harder when I saw Picasso’s renditions in Barcelona. LOVE when the Spain obsession pops up unexpectedly :). 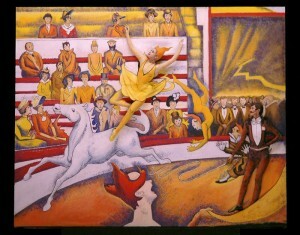 There was a whole range of paintings – from Vermeer and Seurat, to sculptural works, and some by Norman Rockwell. 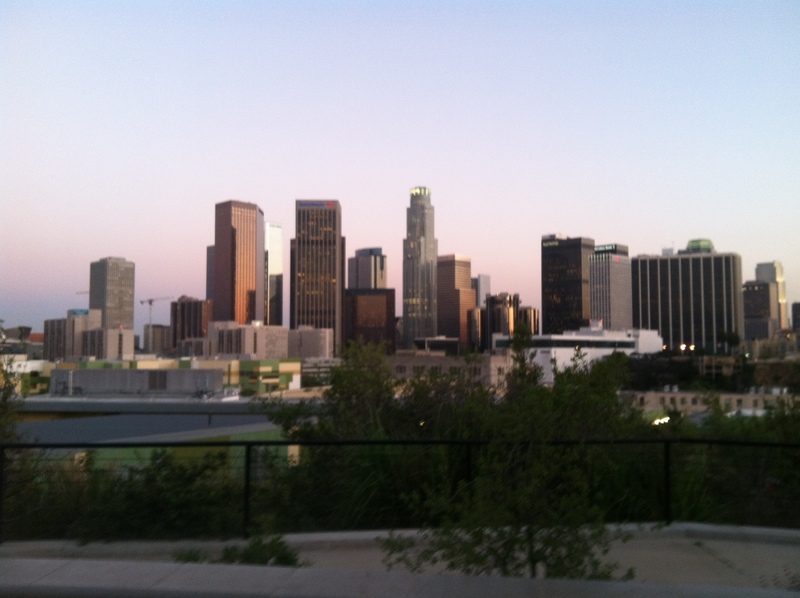 The theme was “Genius” which was cool – and they featured a segment of astronomy and the Griffith Observatory. They also featured a statue that was a Titanic Memorial. They introduced the segment with photos and newspaper headlines from the Titanic, leading me to lean over to my mom and whisper “not sure this fits in the ‘Genius’ category.” Critiques aside, it was a really cool show and experience and I’d go back for sure (as long as the couple directly next to me who were drunkenly making out the entire first act decide to stay home). 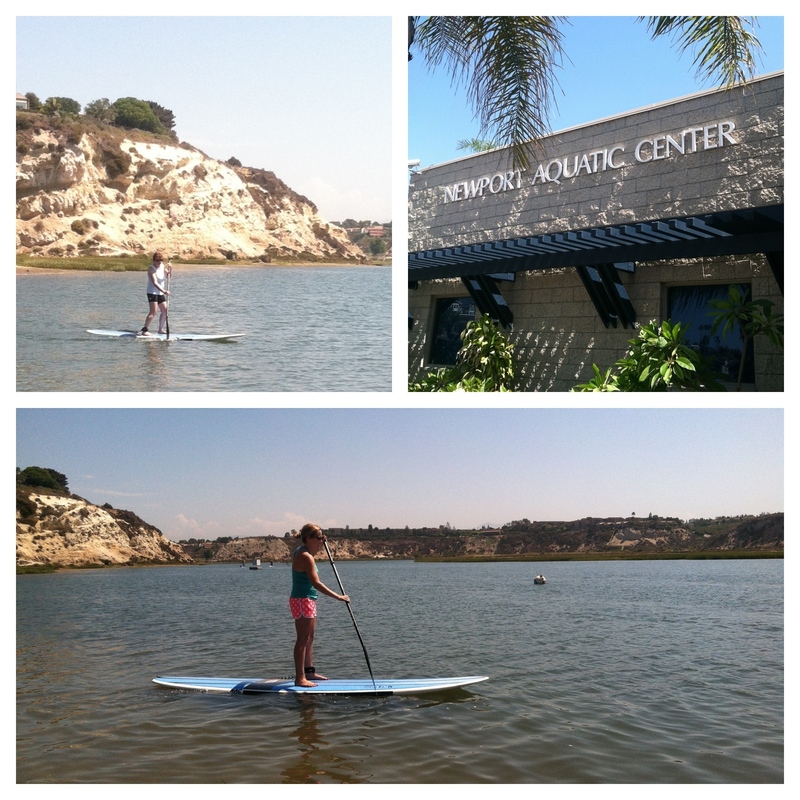 We headed back to Newport that night to get up bright and early for a stand-up paddle boarding (SUP) lesson at the Newport Aquatic Center. 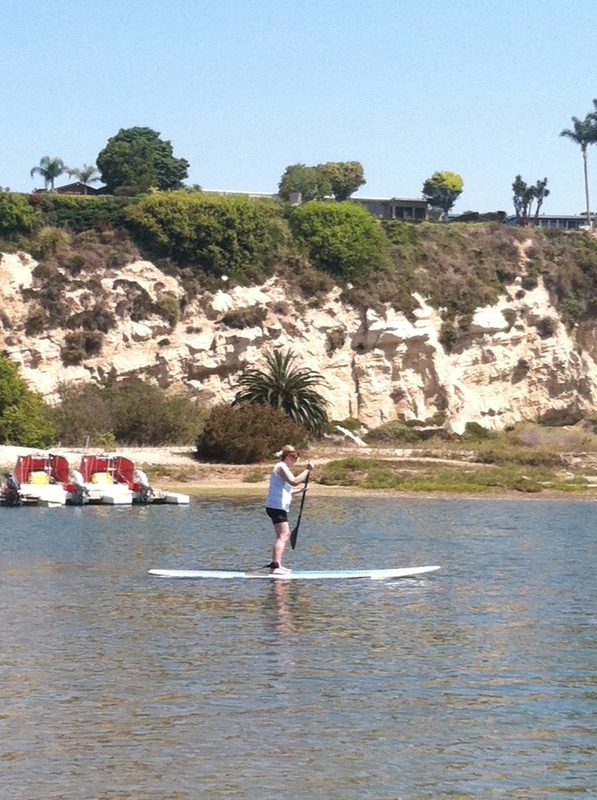 I’d tried it once before in Malibu, but heavy winds left me pretty banged up. My mom arranged for us to take a lesson, and our instructor, Maya, couldn’t have been nicer. 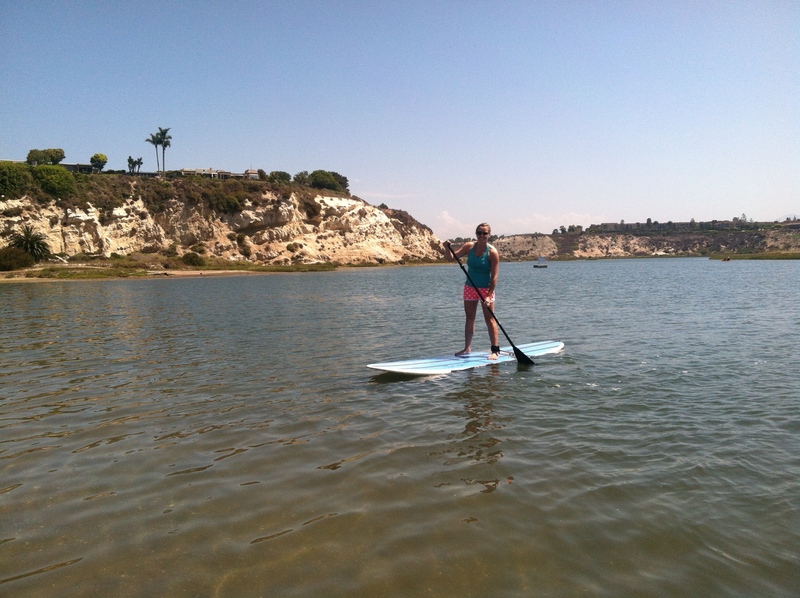 The water was super calm so it was relatively easy. The tips Maya gave us though were helpful (keep both arms SUPER straight the whole time, how to turn, etc). I loved it and need to get back out on a board ASAP. After our boarding experience, we figured out how to avoid dealing with valet at the hotel by utilizing street parking a block or so away. Next up was lunch and shopping at Fashion Island. 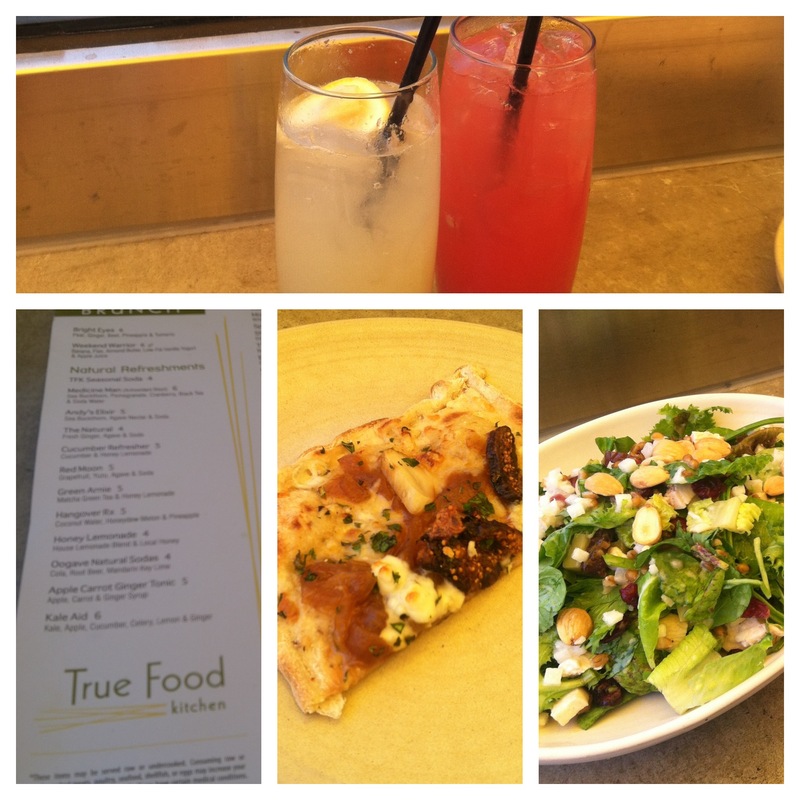 We dined at True Food Kitchen – an eclectic blend of multi-cultural cuisine and real foods. I sipped on a honey lemonade (my mom opted for a watermelon soda but didn’t love it). We split a carmelized onion tart (with black fig + gorgonzola) and I had a chicken chopped salad. 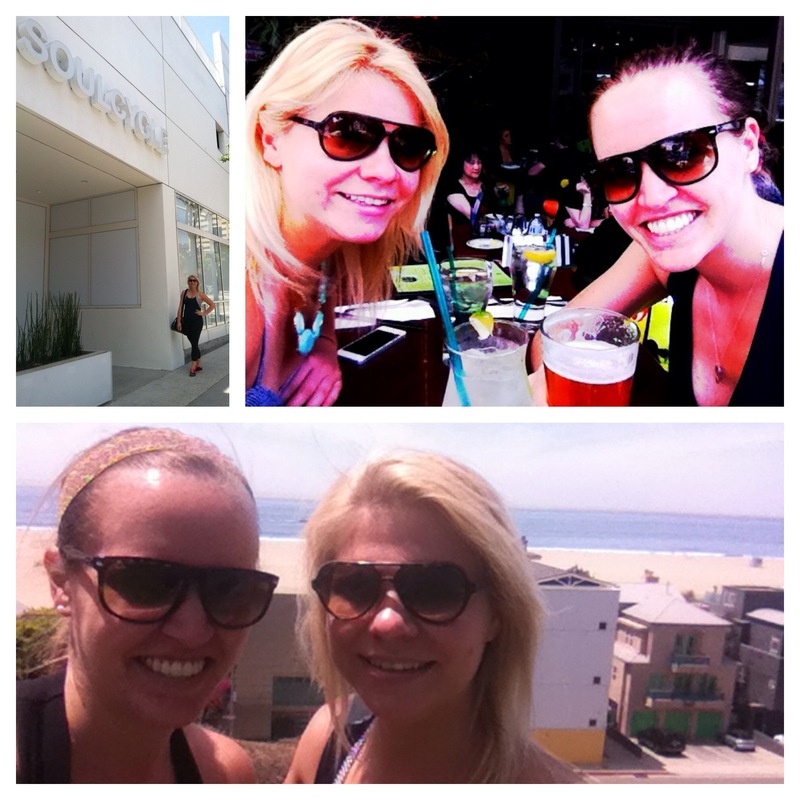 I loved the place and the outdoor seating – so happy to see they have a Santa Monica location! We shopped a bit (I scored two shirts at a boutique), we walked through Corona del Mar (our cross-country arch-rivals), and then we headed back to the hotel. Our room was yet to be made up (a little before 5) so we hung out in the lobby and to our surprise the Men’s Olympic marathon was on. 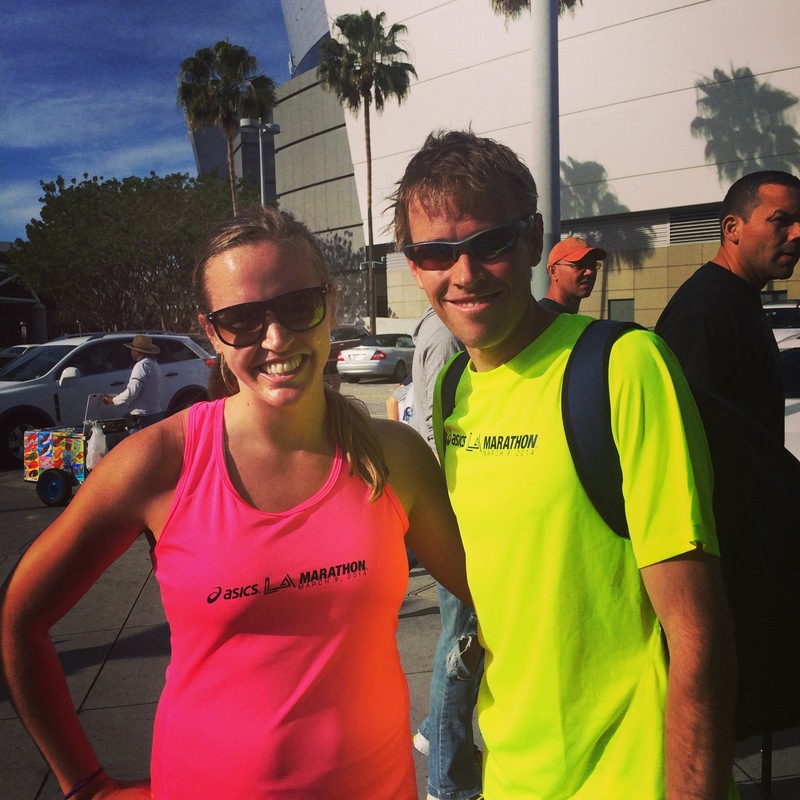 So bummed to hear about Ryan Hall (representing the CA Southern Section!) but Meb (and the three leaders) ran amazing races. 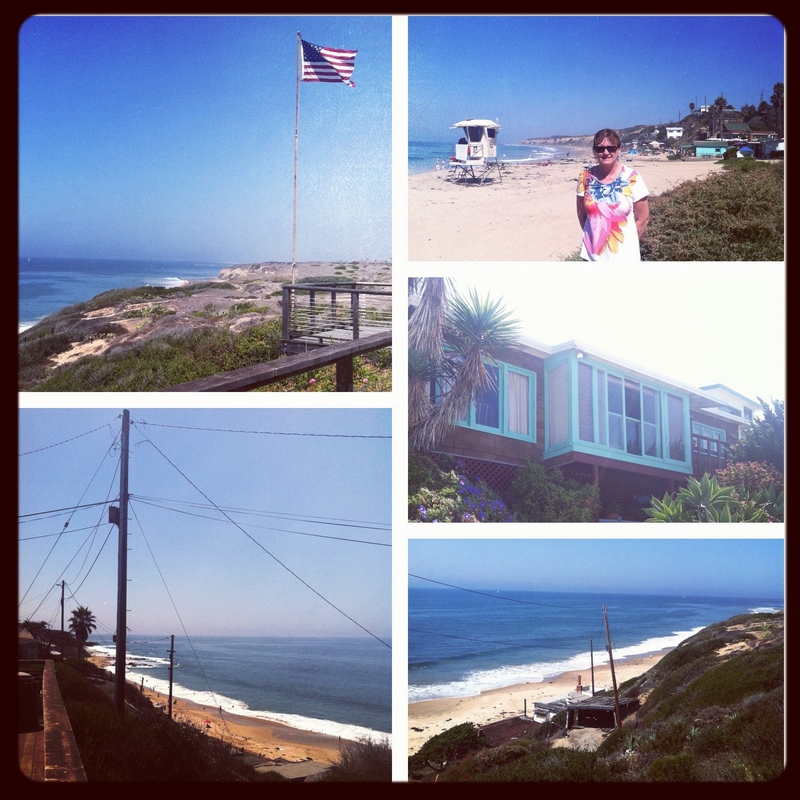 This morning, we headed to Crystal Cove for brunch. Crystal Cove is actually a State Park – and an obsession of my parents’. I was happy to get to see it – but definitely need to come back sometime for happy hour when they raise the martini flag, a tradition that extends back to the 1930s! After brunch at the Beachcomber, we took a leisurely drive back home up PCH. It took forever but we loved seeing the ocean and getting better acquainted with some of the beach cities. All in all, it was an excellent mini-vacation! Favorite thing to do in Orange County?